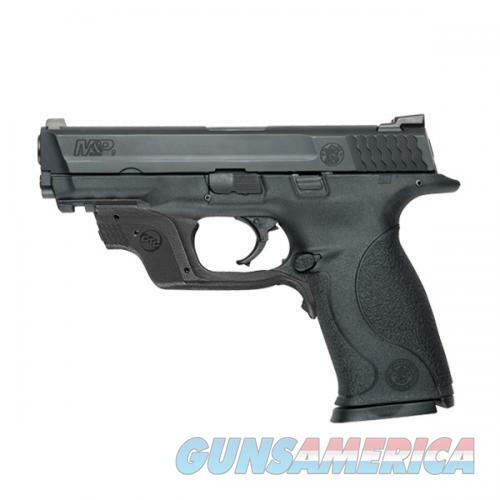 Description: SMITH & WESSON INC 9mm with Crimson Trace Green Smith & Wesson 10174 M&P 9mm w/Crimson Trace Green Double 9mm 4.25" 17+1 This is the M&P9 full size with crimson Trace Laser in green attached to trigger guard. It features, Simple Take Down, 3 Interchangeable Palmswell Grip Sizes to Customize Grip, Ambbidextrous Controls, 18 Grip Angle for Natural Point of Aim, Ships with Crimson Trace® Green Laserguard® with front activation. Adjustable for Elevation and Windage. 2 Hour Battery Life. One 1/3N Lithium Battery.